In a saucepan, heat a little olive oil and sauté the gnocchi for a few minutes, until they are tender and golden brown. Toss the cherry tomatoes in a bowl with olive oil, chopped basil and a generous amount of salt and pepper. Add the gnocchi to the bowl, and gently toss once more until well combined. 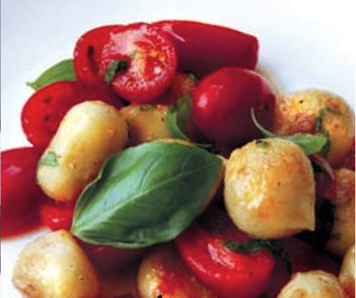 Spoon the gnocchi on the plates and finish by sprinkling with some whole basil leaves. Enjoy!